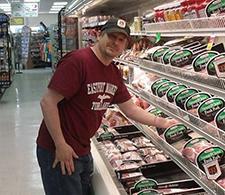 It's no secret that Eastport Market has some of the best cuts of beef, pork and chicken around. We dare you to compare both the quality and price of our meats and seafood to our competitors. And much of what you find in our meat case is prepared right on the premises by our own butchers. Can't find exactly what you're looking for? Just stop by the meat room (the door immediately to the right of the meat case) and our butchers will do their best to either cut it for you as soon as possible - or make sure whatever you need is included in our next order. At Eastport Market we're also proud to feature quality, cost-effective meat bundles, Dearborn hams and Little Town Jerky from the good people just down the road a bit at Ebels General Store in Falmouth, Michigan.